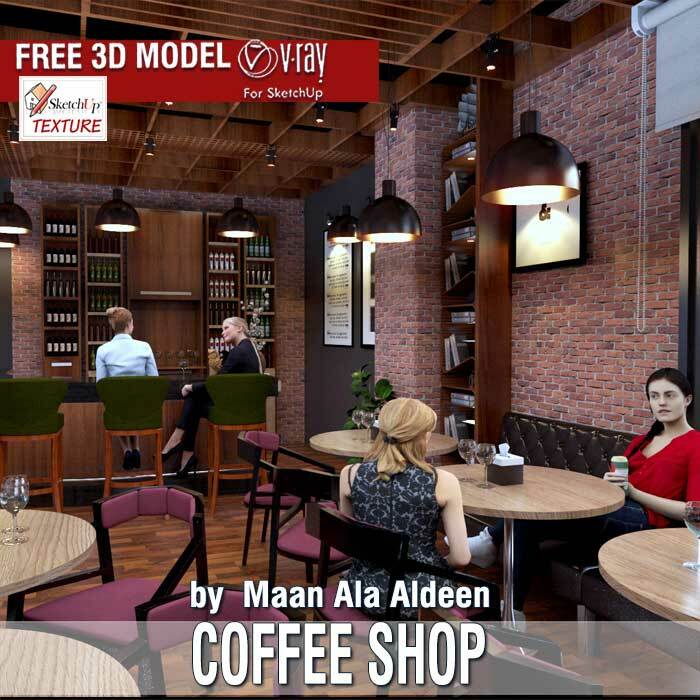 I am happy to share with you my last Sketchup 3d model "coffee shop in Azazga hotel ", full of great 3d components to be used in your 3D scenes, full textured. This building, by Félix Candela Spanish architect, is located in Xochimilco is considered a very significant to have their origins in pre-Hispanic period to the present day Mexico City. The place is known for having one of the major sources of fresh water to supply the city. Los Manantiales was created as Candela’s mastery thin-shell concrete construction was solidifying. Initially conceived for another client on a different site, the structure found realization as a replacement for a wooden restaurant alongside a floating gardens filled canal in the Xochimilco area of Mexico City. During the twentieth century, Xochimilco was (and remains) a place of recreation for the inhabitants of Mexico City that Sunday to Sunday strolling through the channels in so-called "trajineras" (wooden boats) by the lake of the same site , lingering with the floating gardens that exist here. The decision to fire was the design of a circular dome, formed by the intersection of eight segments from the meeting of four hyperbolic paraboloid (surface similar to that of a saddle horse). 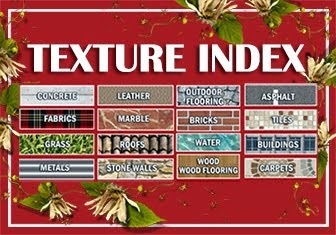 The maturity and insight of Candela allowed to eliminate the edge beam and concentrate the weight support structure starting at the supports that are tucked into the outer edge of the paraboloids. At first glance you see the concrete lip that never touches the earth and keeps the flight. In the front edges of the parables we can see how close the space from glass plates with metallic trim 2.40 x 2.40 meters. 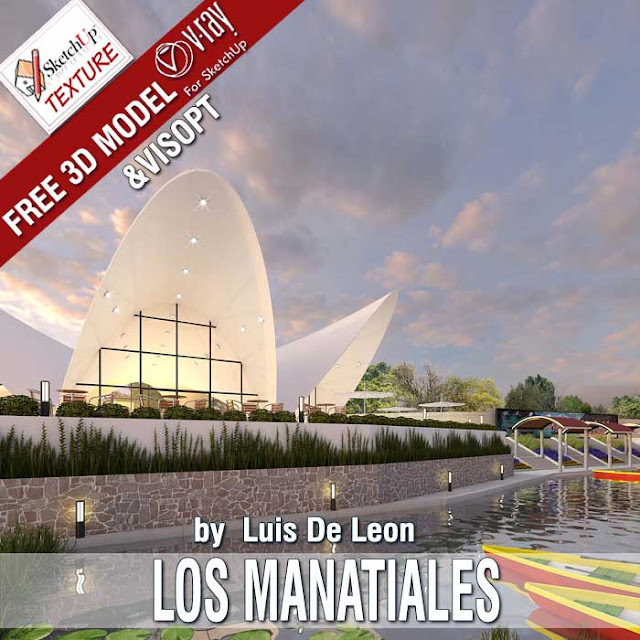 I wanted to model the Los Manantiales Restaurant in sketchUp, trying to reproduce better the original project, and share it with all members of Sketchup Texture Club hoping you enjoy it. 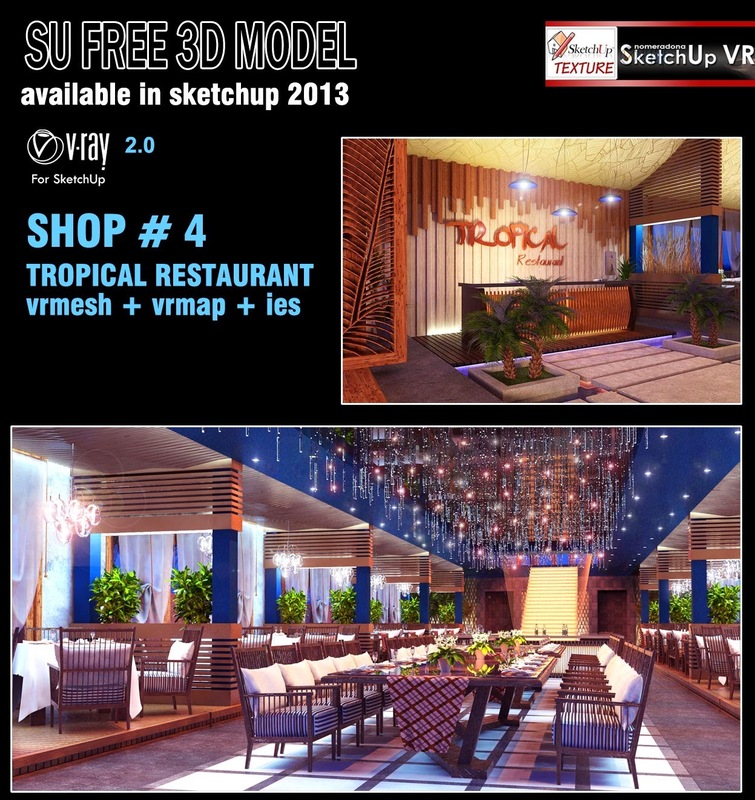 The 3D model is available in SketchUp 8 so everyone can download it. 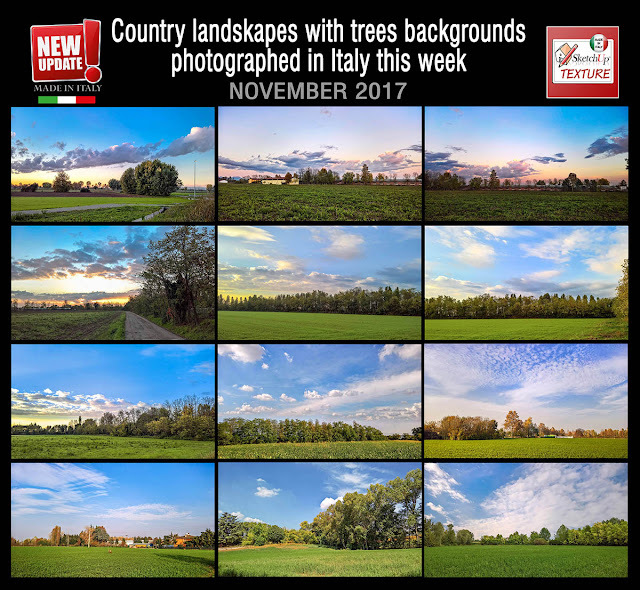 The overview of images that you see below is a small selection of the works of the artists who participated and who, even today, we thank and remember fondly because they were the first to support us. This is a tribute dedicated to all of them. 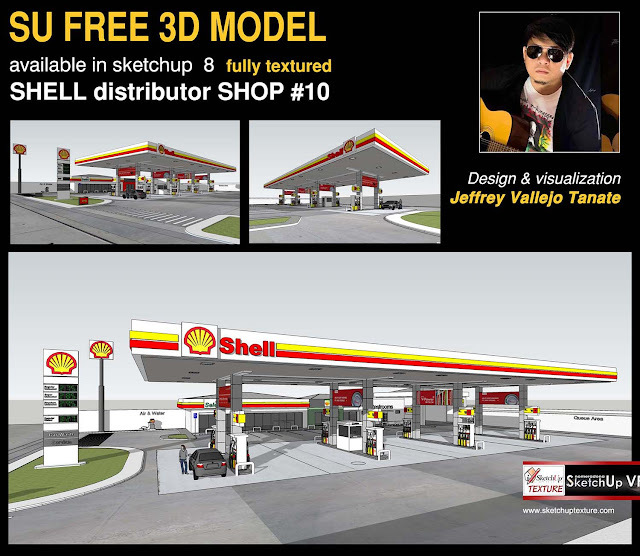 This fantastic sketchup 3d model is a courtesy by Jeffrey Vallejo Tanate who shared exclusively for us, his project of this classic Shell distributor , made in sketchup 2015 but available in sketchup 8, full all textures, which it was much appreciated by all the members of our working group , that certainly will appreciate the courteous sharing. 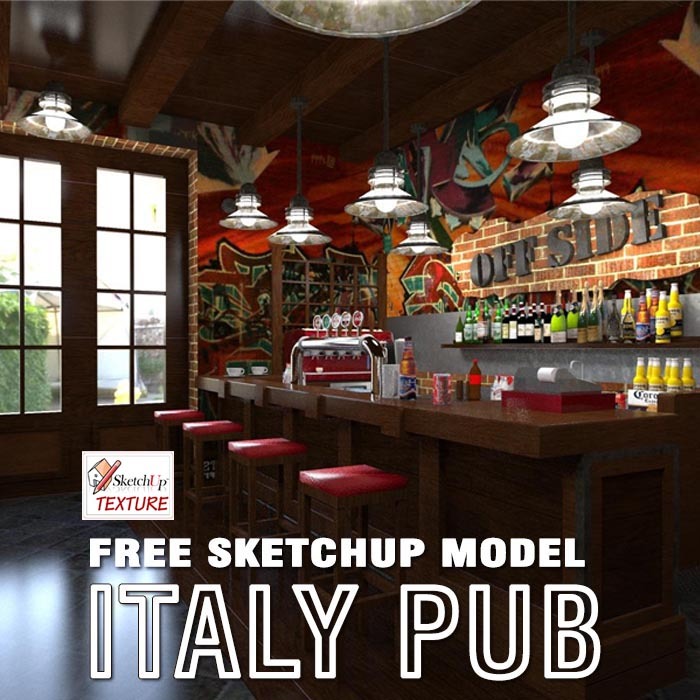 Thank you very much Jeffrey for this useful contribution to "sketchup texture community" ! 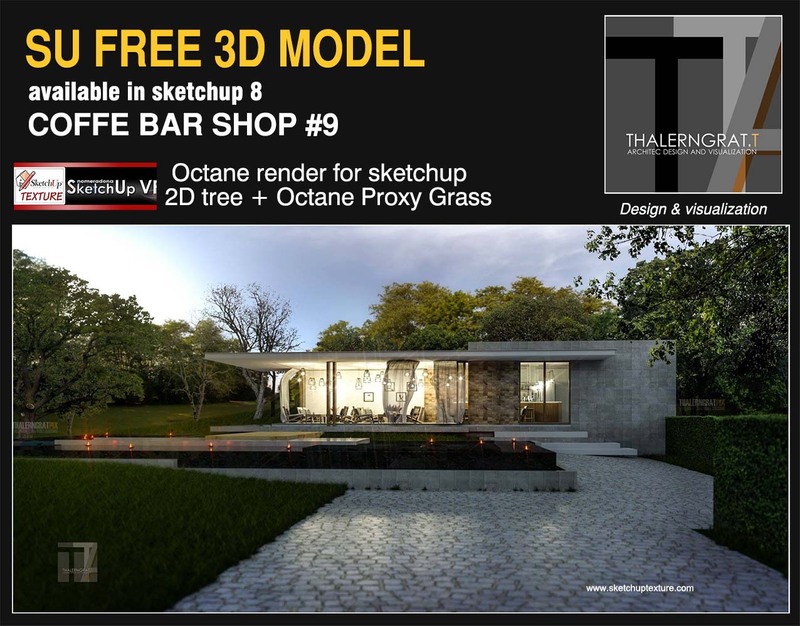 This wonderfull sketchup 3d model is a courtesy by Thalerngrat T. Nuke, who shared exclusively for us, his project of this contemporary coffee bar, made in sketchup 2014, but available in sketchup 8, fully furnished with splendid facilities, full all textures, 2d trees and Octane Proxy grass, rendered with Ocatane for sketchup Thank you very much Thalerngrat for this useful contribution to "sketchup texture community" ! 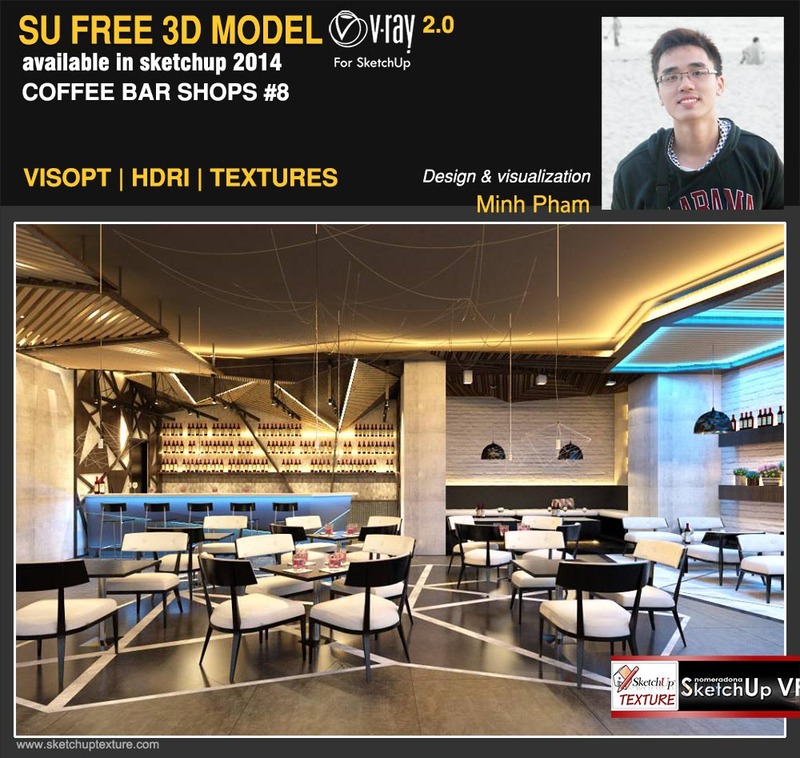 This excellent sketchup 3d model is a courtesy by Minh Phạm who shared exclusively for us, his project of this contemporary coffee bar, available in sketchup 2014, full all textures, ies light, vray interior visopt and HDRI for Dome Light by using which, launching the render, you can get the same result that you can see in the scenes below. 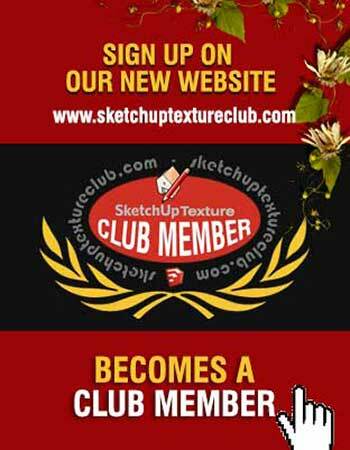 Thank you very much Minh Phạm for this useful contribution to "sketchup texture community" ! 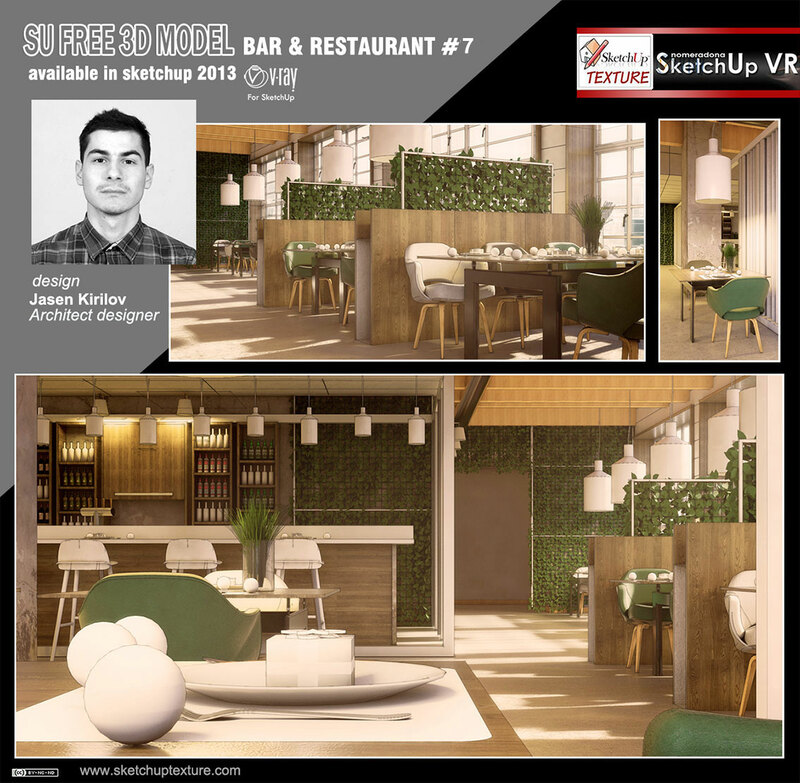 This excellent work of Jasen Kirilov, is not just sharing a 3d model. This is a personal project to test the skills and different post production on photoshop. 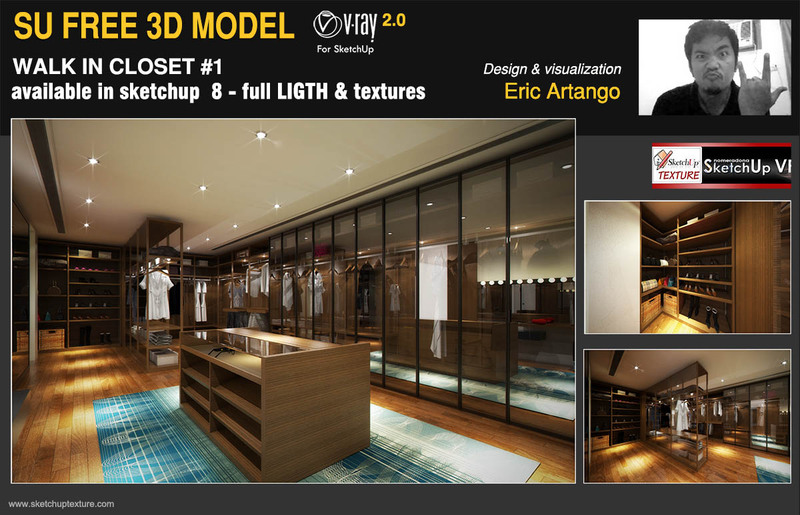 Here has been used Sketchup and Vray for the rendering and Photoshop CS5 for the post production. Was added the HDRI map and the settings used , available in the file attached . 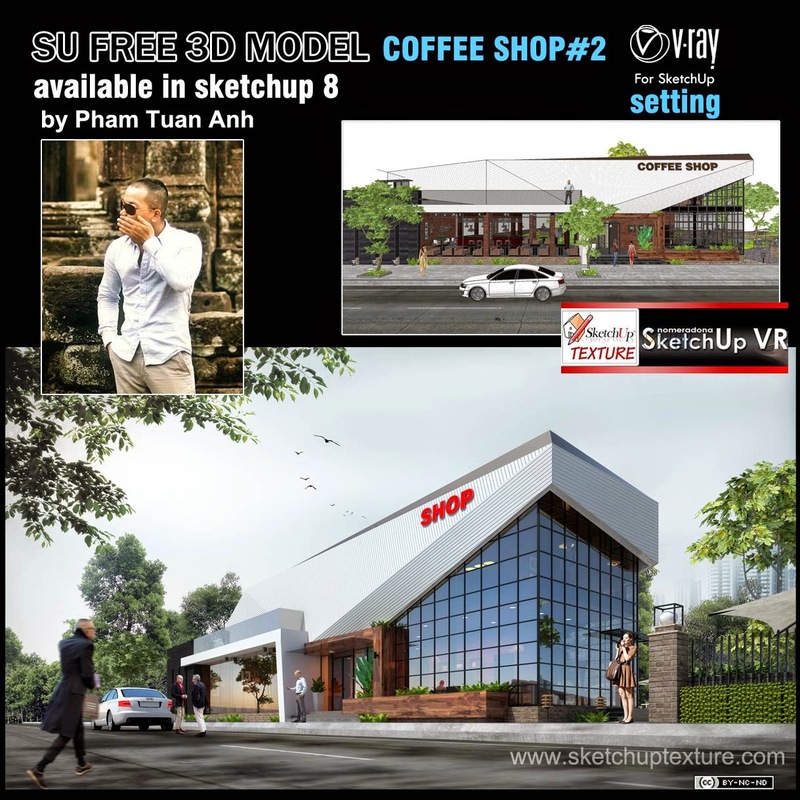 Also you will find in the attached file the different channels from sketchup vray that Jasen he used in photoshop to further improve the final result. 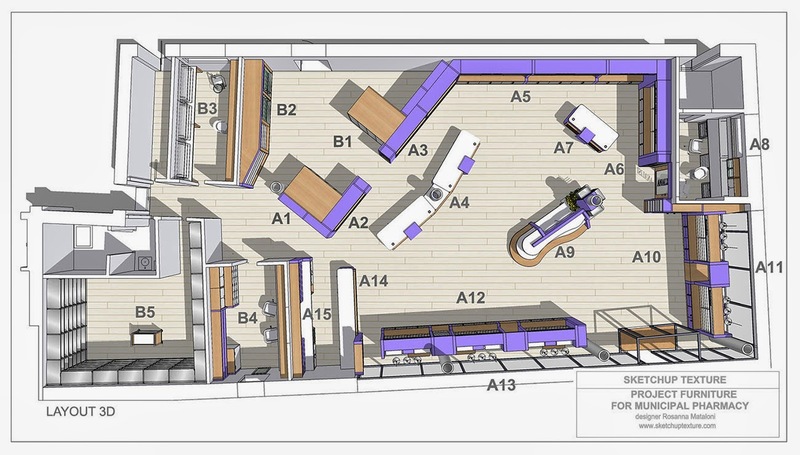 Furthermore has exported an image directly from sketchup with the hidden lines to use in photoshop in order to make the final render a bit more cartoony. In the attached file , you will find also all photoshop files to further understand all the workflow. Many thanks to Yasen, for sharing this 3d model and for all the valuable material you sent us! 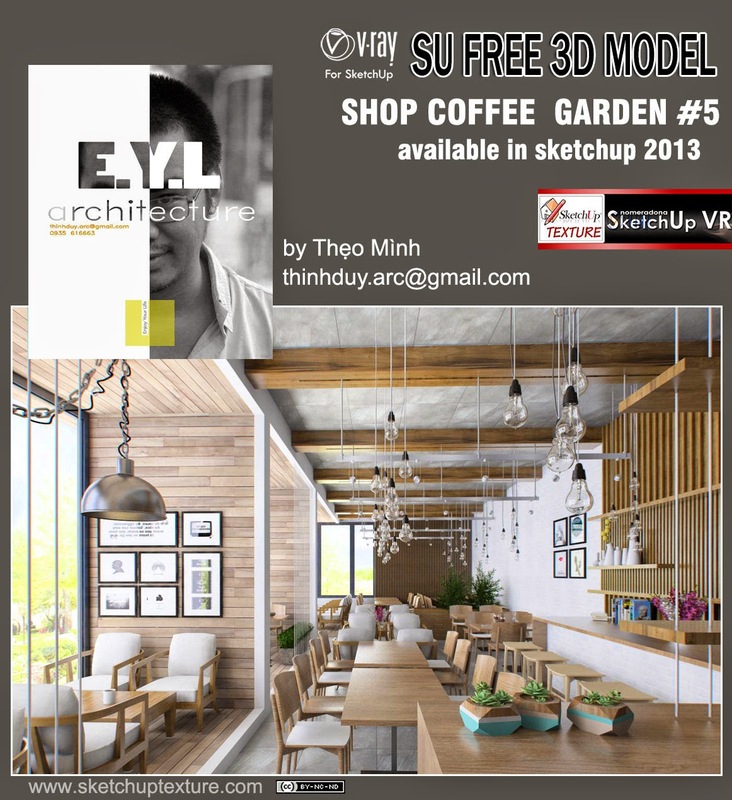 Really excellent this 3d model shared by Theo Minh, interior design to E.Y.L. Architecture. 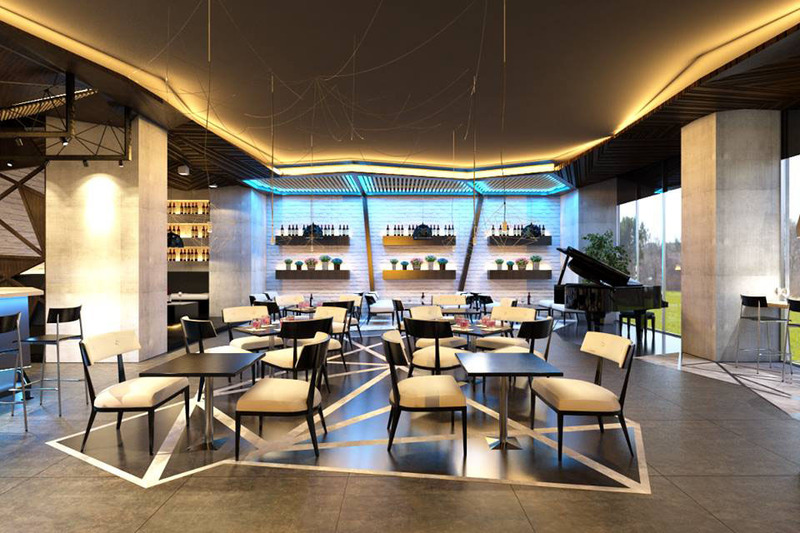 It is a coffee bar with terrace and large windows that overlook an outdoor space fully furnished. The choice of warm wood tones, and comfortable upholstered armchairs, with modern design, give the environment a relaxed and cozy atmosphere. It comes to a modern building with large bright windows, designed to accommodate a Coffe shop, with a design really excellent. The mixture of materials, such as wood, glass and concrete gives it a very welcoming and pleasant. The 3d model is available in sketchup 8, complete with textures, fully 3d furnished , 3d trees, vray lights, and ready to be rendered with V-Ray for sketchup. Thank you very much, Pham Tuan Anh for wanting to share with us this splendid work! Chiang Khong is the Thai counterpart to the Lao border town of Huay Xai , just across the Mekong. Chiang Khong is a fast growing town with a bridge to Laos about to open. The village was more recently made famous by British cyclist Alan Bate, who broke the Guinness World Record for the fastest circumnavigation of the Earth by bicycle in 2010. 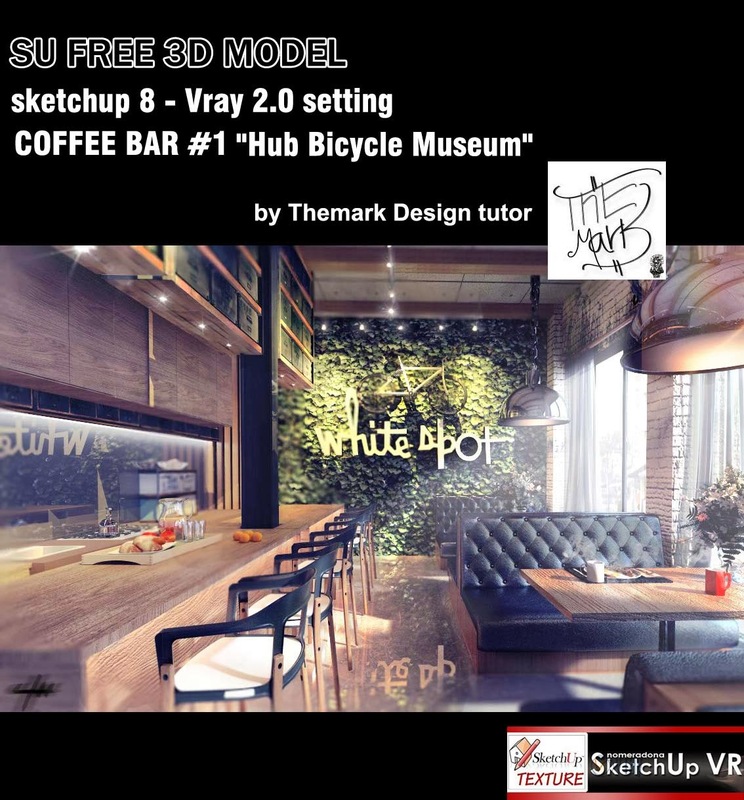 In the village he has opened the "The Hub pub",the free to enter,"Hub bicycle museum"
This excellent model is shared by our friend Themark Design tutor, architect and interior Thai design, complete with textures and ready to be rendered with vray 2.0. Thank you very much our friend for this double useful sharing!